For years, my ‘go to’ pizza dough recipes has been Jamie Oliver’s pizza dough recipe. This fail-proof recipe has given me a reputation amongst my son’s friends that these are pizzas that are to die for. The actual verbatim comment was “pizzas worth killing for”. The only problem with this pizza dough is that it does take time and, while most of that time is just waiting for the dough to rise, all this happens within an inconvenient timeframe (two hours or more), which rules it out homemade pizza for Friday nights or mid-week, or even those weekend nights when you arrive home late from the beach. Homemade pizza is not a spontaneous kind of meal. Meanwhile, my son and his friends kept nagging me for Friday night pizza – although my homemade pizza is the considered the best, takeaway pizza was seen as an acceptable substitute. 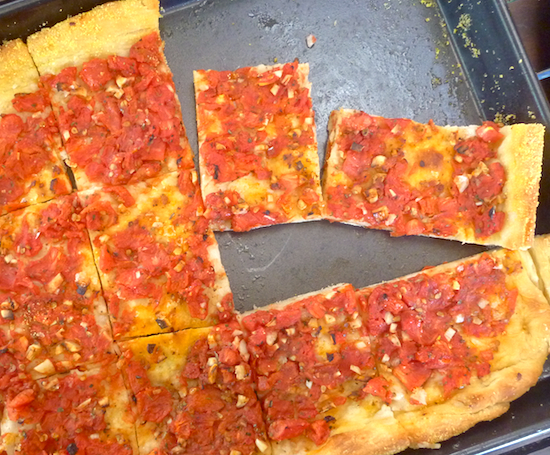 But if you make a half-way decent homemade pizza, you tend to resent forking out 20 bucks for a simple pizza. I mean, flour, water yeast, a slosh of tomato sauce and cheese – you can’t get more basic, ingredient wise, and if you’re feeding pizza fiends who eat a lot of pizza, it can get quite expensive. I had heard about Jim Lahey’s no-knead pizza dough – I’d always discounted at having that much of a time saving effect. After all, how long does it take to knead pizza (10 minutes) and I actually like kneading dough, but it was only after reading a post on Smitten Kitchen that the brilliance of Lahey’s no-knead technique was revealed. This is actually a slow-rise dough which can be adapted to different rise times: 22 hours, 12 hours or six hours, so you can mix a dough and you just leave it to slowly rise to bake off at the time of your convenience. This doesn’t make homemade pizza a spontaneous meal but, with a small amount of forward planning, it does make it fast and convenient, for Friday night or any night of the week. More importantly, this slow rise method gives dough time to develop a fantastic flavour similar to a sour dough, with a light, chewy crust. It’s not an elastic, supple dough that you can roll out. This is a sticky dough that is sort of pressed out into shape, it’s all a bit blobby and messy, and I find it easier to press it directly onto a lightly-oiled pizza tray with floured hands, rather than shaping it on cornmeal on pizza paddle and then transferring it onto a pizza stone. This dough is excellent for making big sheet trays of pizza. 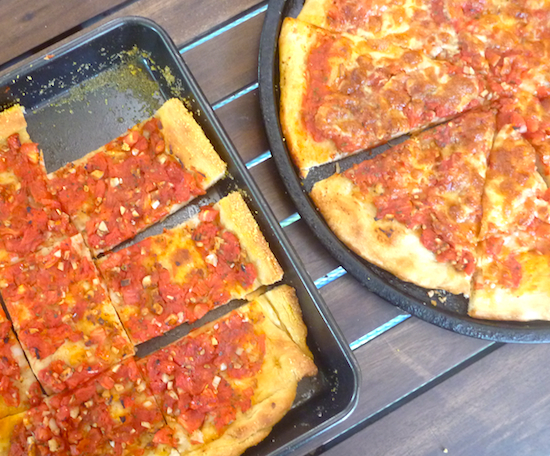 If you want to bake a tray pizza to take on a picnic or to a party, just do the overnight 12-hour proving and then bake it off the next morning. This recipe will make enough dough for 2 x 30 cm (12 inch) pizzas. Because I’m feeding pizza fiends, I usually up the amount of dough slightly by adding an extra cup of flour and adjust the yeast measurements in a fairly haphazard unscientific way by just adding a tiny of bit extra yeast and salt. It all seems to work: this is a very forgiving dough and can cope with a slight under proving or over proving. Once fully proofed, it can also be shaped into balls, covered and refrigerated for up to three days. You just need to let it come to room temperature (about 2–3 hours) before shaping and baking it. Cornmeal or polenta for sprinkling under crust (optional). In large bowl, whisk together flour, salt and dry yeast. Mix in water until you have a dough. It will be rough, craggy and dense looking and look like a bit of a mess. If it is too dry, just add more water, a tablespoon at a time, until you have no dry floury bits but the dough is not soggy. Cover the bowl well with Glad Wrap and just leave it to slowly work its magic. In a traditional Napoletana, pizza is made without cheese, the tomatoes aren’t cooked, just drained of excess juices, and combined with dried or fresh oregano and garlic. 3 cups of peeled fresh tomatoes, or two cans of whole drained tomatoes chopped. 1 tablespoon of dried or 2 tablespoons of fresh chopped oregano (or you can use fresh basil, if available). 1 teaspoon salt sea salt. 250 grams (8 ounces) grated mozzarella (optional). If using fresh tomatoes, blanch tomatoes in boiling water and peel before chopping. Place tomatoes in a colander and press out as much juice as you can. Mix with oregano, garlic and salt. When I’m using canned tomatoes, I usually process the tomatoes to make a smooth sauce. You don’t have to chop the canned tomatoes, just let them drain for half an hour in a colander and whiz in a processor with herbs, salt and garlic. When you are ready to bake your pizza (if using a baking stone, place baking stone in oven) and preheat oven to 220°–250°C (500°–550°F). If you are using a paddle and pizza stone, sprinkle baking paper with polenta and, with floured hands, press out dough to required size, cover with toppings and transfer to paddle and then to oven. The easier alternative with this dough is to lightly oil tray and, with floured hands, gently drop half the dough onto the tray and press out dough as thinly as possible. (If you like the extra crunch and taste of polenta on the bottom of your pizza, lightly sprinkle the oiled tray with polenta). Spread sauce over pizza, strew mozzarella over the top, season with extra salt and sprinkle olive oil over surface and brush edges of pizza with olive oil. 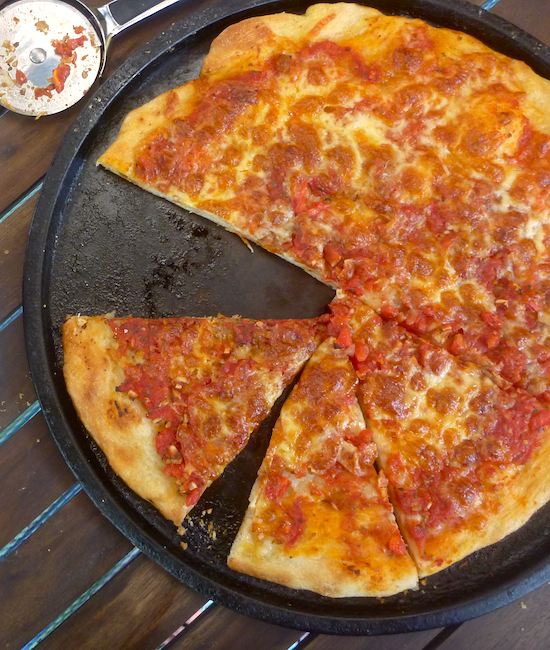 Remove pizza to board and cut with a pizza wheel. Extra toppings can be added as desired: marinated artichokes, roasted red peppers, olives, chilli flakes are all good, but this simple Napoletana pizza with cheese is the favorite in our family. Looks amazing Elizabeth. I’ll have to pass on the recipe to my pizza-loving father. Thanks so much for aĺl the lovely recipes that you send,,, but my favorite and most often cooked of your recipes is your Ma Po tofu! Absolutely awesome and I cook it once a week. Take care and keep em comin. The Mapo Tofu is one of my favs as well. I will have to try both doughs for myself to pick my favorite! Your sauce looks delicious, as wlel. This does make homemade pizza super convenient and it’s great for making a big tray pizza for a picnic just mix the dough the night before and bake it up in the morning.